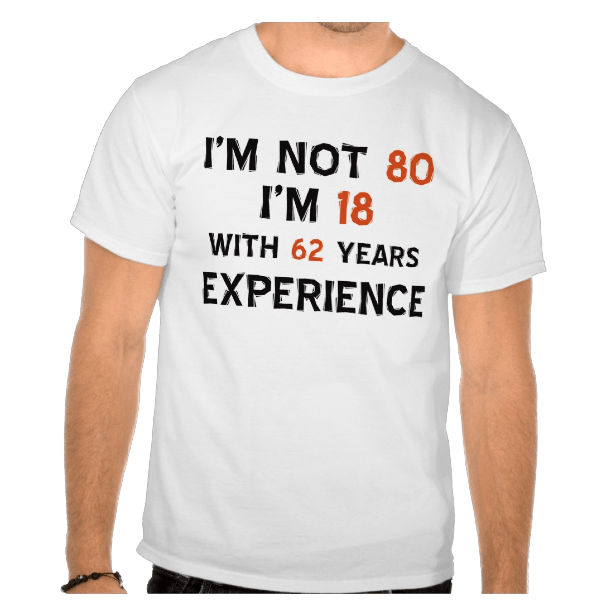 Looking for unique 80th birthday gifts for men? Find the perfect present here! 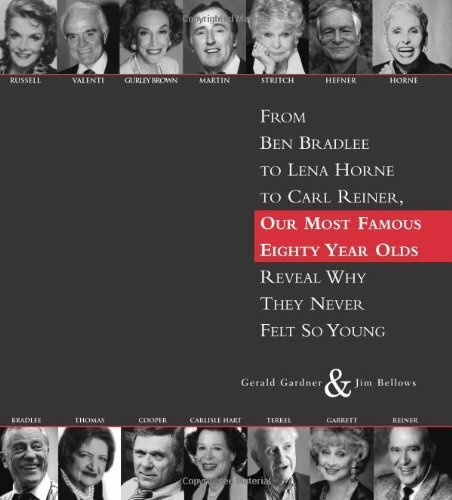 This striking book is one of our top-selling gifts – and it’s sure to be a hit for any senior man’s birthday! 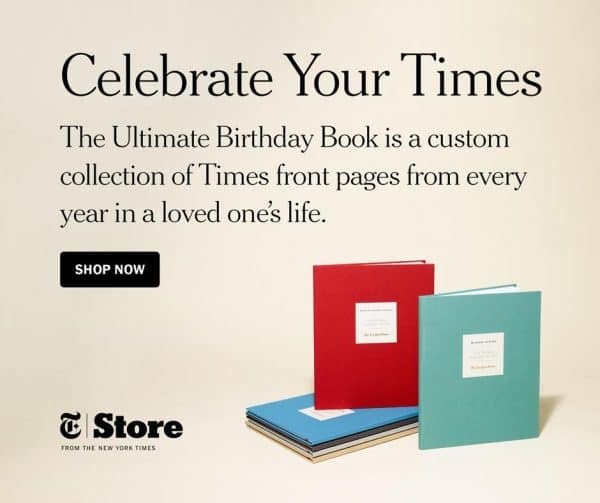 Personalized book features every New York Times front page from his birthday for his entire life! It’s 80 years of memories and historical events all bound together in a hardbound book that’s personalized with the birthday man’s name and birthdate. The book also includes an exclusive photo-filled 20 page timeline, a magnifier, and additional pages of world headline events. 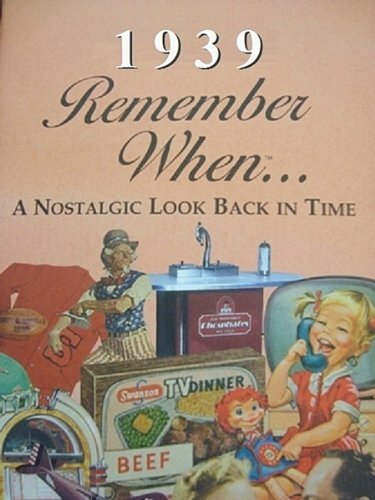 The recipient will enjoy reading the book and remembering long-forgotten historical events long after the birthday has come and gone. A fun and affordable gift that’s perfect for the man who has everything! The handsome plaque features his name and birthdate at the top. The headline news, songs, movies and sports results from his birthdate are listed below. The keepsake also features a fun cost of living comparison chart between now and then, as well as celebrities who share his birthdate. Gift baskets are always exciting gifts to receive (and almost as much fun to choose)! My top pick for 80th birthday gift baskets is GiftTree. They offer a fabulous assortment of unique, top-notch gift baskets and towers ranging in price from under $25 to $500. 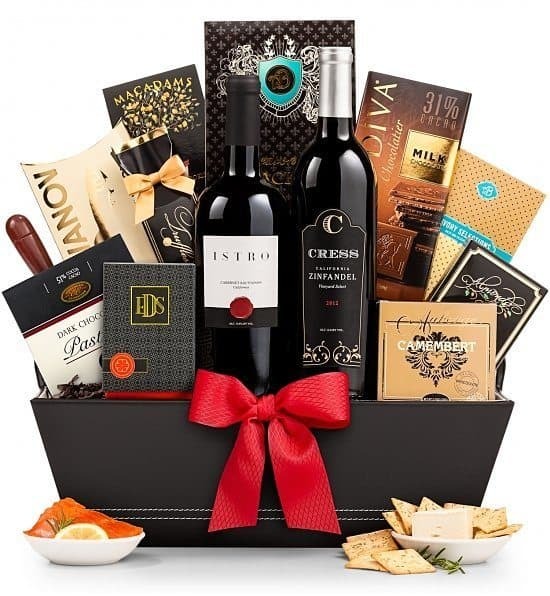 You can choose from beer gift baskets, wine baskets, champagne gifts, fruit baskets and gourmet food towers and baskets. My favorite part? 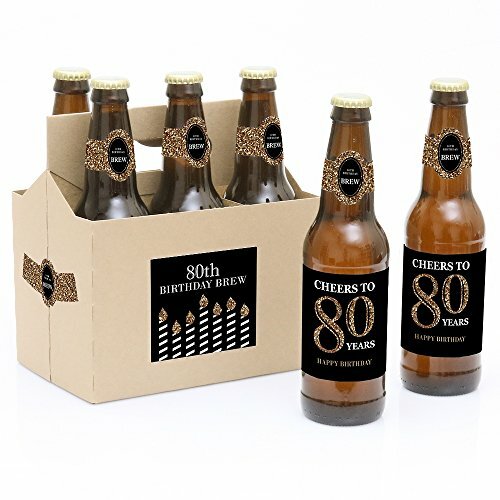 You can order a personalized ribbon for most of their gift baskets – which gives you plenty of room to add your own special Happy 80th birthday message. A fun way to highlight the news from the day he was born! 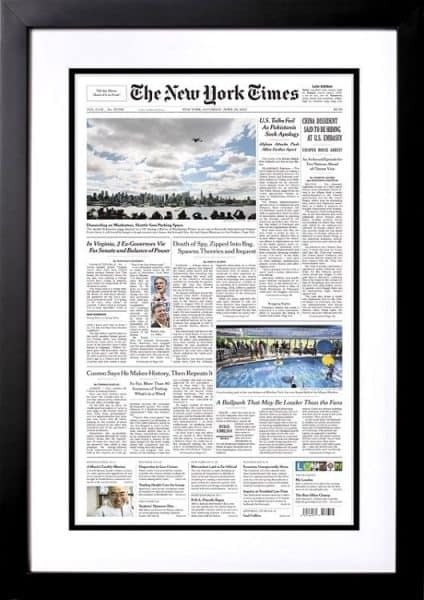 This unique gift features an exact replica of the front page of The New York Times from his birth date. It’s available in 3 different sizes that vary in difficulty. A clever present that he can enjoy with his family and friends. An 80th birthday calls for a memorable toast – why not treat him to a personalized bottle of wine that he will enjoy as a keepsake long after the toast! 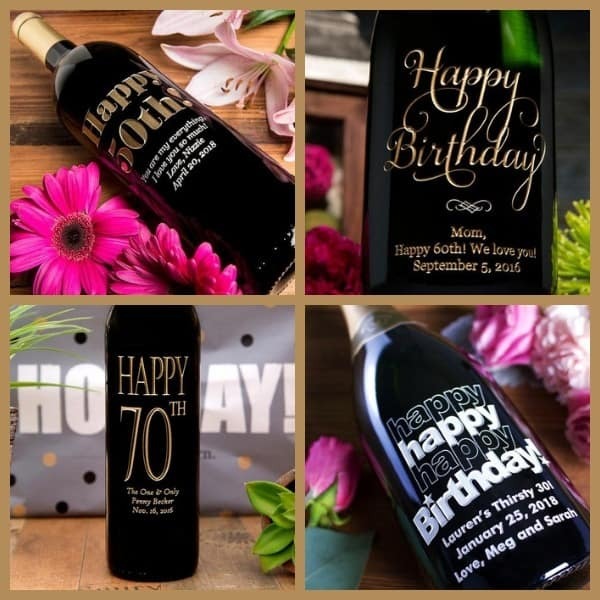 Etched Wine features over 30 different birthday designs that can be personalized with your own Happy 80th Birthday message. Choose from merlot, chardonnay, cabernet or champagne. You can also choose to add luxury wine glasses. He can enjoy the wine now – and enjoy displaying the bottle for years to come! 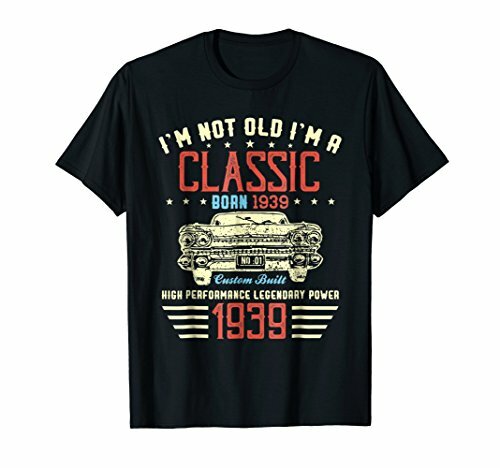 Let the whole world know that he’s 80 with a new shirt! 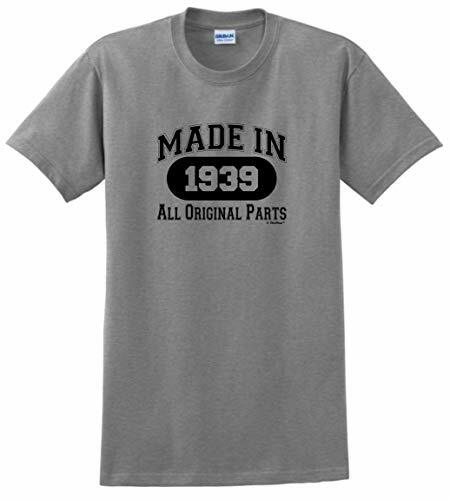 Zazzle has hundreds of men’s t-shirts with different sayings and graphics especially for an 80th birthday. 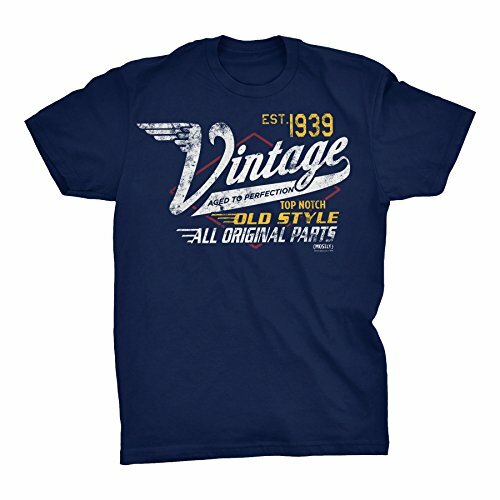 Most of their shirts come in a variety of styles and colors; just click on any shirt that you like for more details. Looking for a unique gift for the man who has everything? 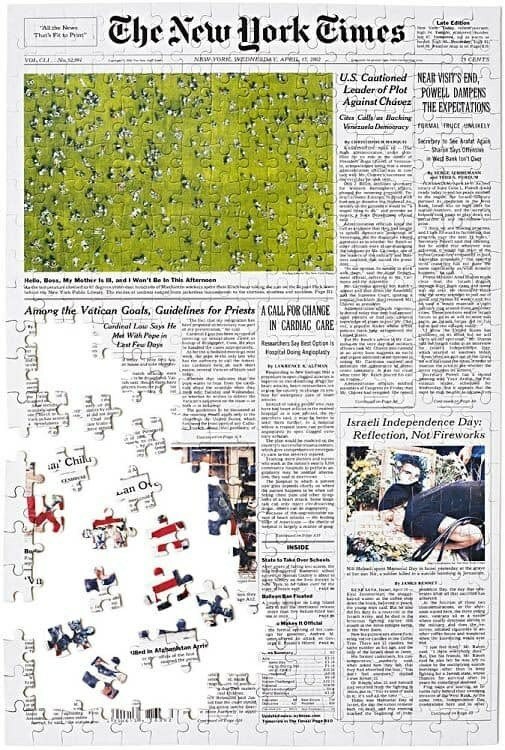 He probably doesn’t have this – a copy of The New York Times front page from the day he was born! Available in 3 sizes, either framed of unframed, this impressive gift is sure to spark conversations, and will look great on his tabletop or wall. 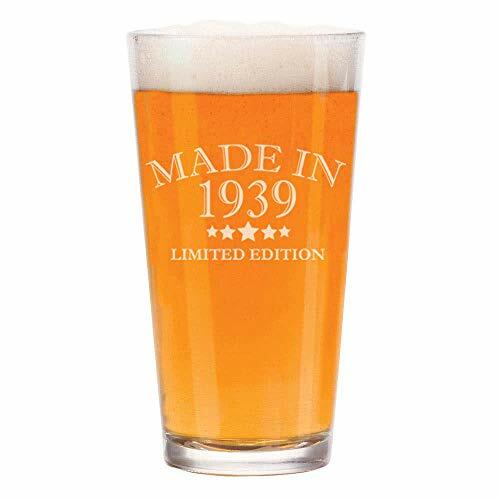 A man who’s turning the big 8-0 certainly deserves to kick back with a cold beer! 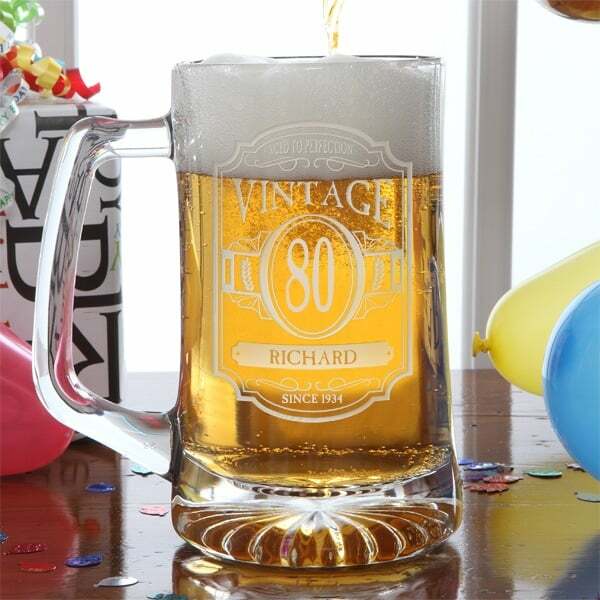 This handsome oversized beer mug features his age and 2 additional lines of personalization. The perfect present for the beer lover! Nothing quite says “Celebrate” like champagne – and GiftTree features a wonderful collection of sophisticated champagne gift baskets! 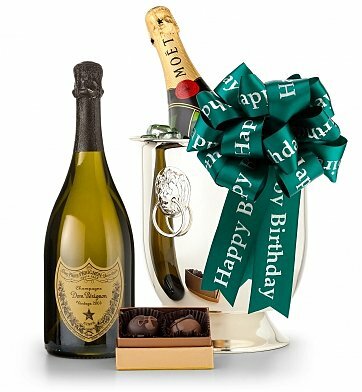 Delight your favorite senior with this handsome champagne and chocolate gift basket that arrives in an elegant classic champagne chiller. Choose from 4 different champagnes – prices start at under $75. You can order a personalized ribbon for an extra-special touch. 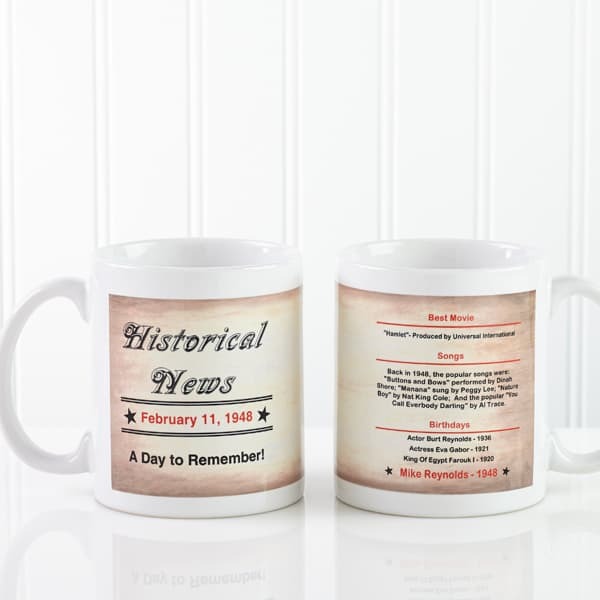 This affordable coffee mug - under $20 - features his name and birth date on one side and historical trivia from the day he was born on the other. Anyone reaching this age can probably use a little extra caffeine to get going each day! 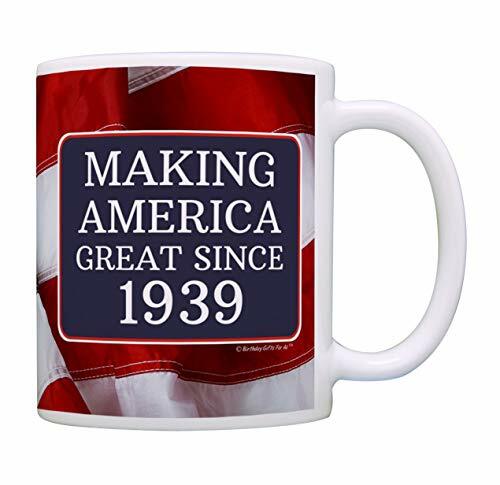 His favorite hot beverage will taste even better with a mug that’s made especially in honor this occasion. A coffee mug is a fun stand-alone gift, or makes a great addition to a coffee or tea gift basket. 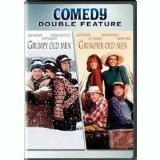 Looking for a gag gift for the 80 year old with a sense of humor? 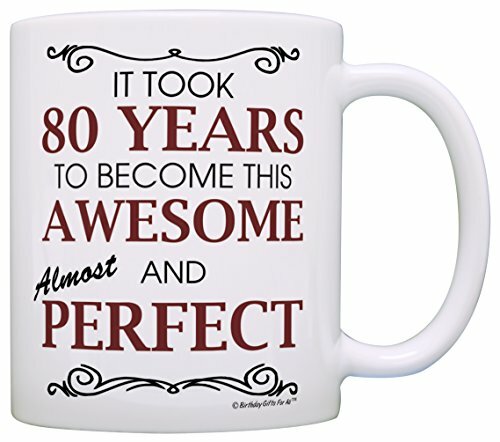 Check out the selection at CafePress – they offer literally hundreds of funny 80th birthday gifts! 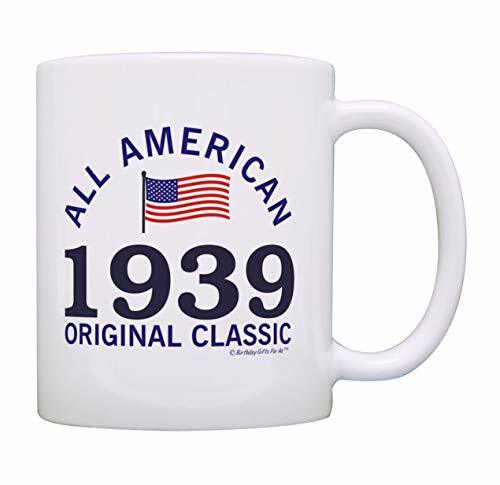 Choose from shirts, hats, keychains, buttons, cards, golf balls, mugs and more (you can even get 80th birthday flip flops if you’re so inclined). Helpful tip: If you see a saying that you like, just click on that product. On the detail page, look under “ABOUT THE DESIGN” and click on “See this design on other products” to see what other products you can get that saying on. Make your favorite senior’s day extra special with this handsome personalized wine crate! His name and birthday year are inscribedon a sturdy wooden wine crate that makes a wonderful keepsake long after the wine is enjoyed. Choose from 3 bottles of award-winning wines. 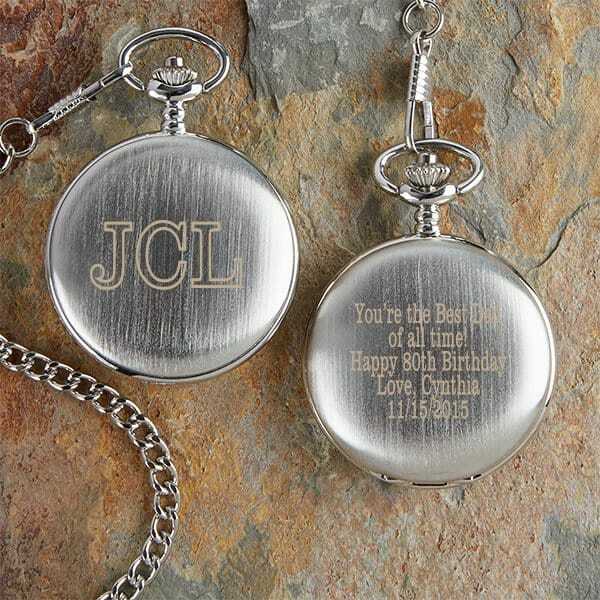 Bring back the glamour of long-ago days with a personalized pocket watch that’s custom-made just for him! The outside of this handsome watch is engraved with his monogram. Add your own 5-line message to the back. A keepsake that he will treasure for all time – at just around $50! He’ll want to preserve and showcase his favorite pictures from the big day, and this personalized frame is the perfect choice! 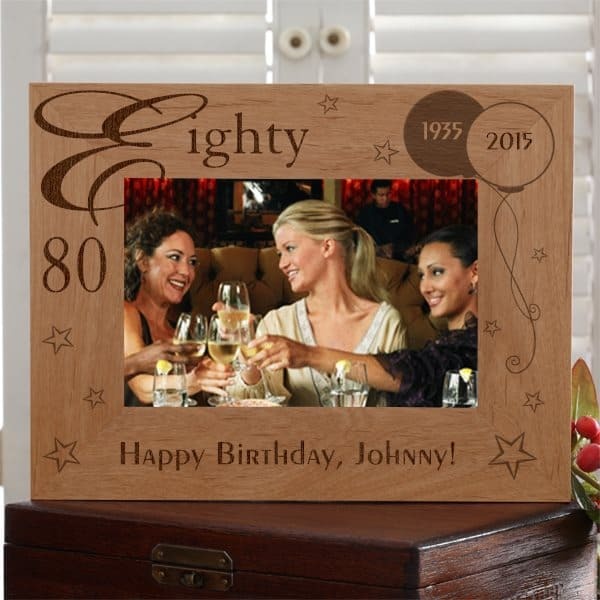 Available in both horizontal and vertical styles, the wooden frame features his age and birth year engraved upon the frame. Add your own birthday message at the bottom. Need a last minute gift? This can ship in just 1 day! 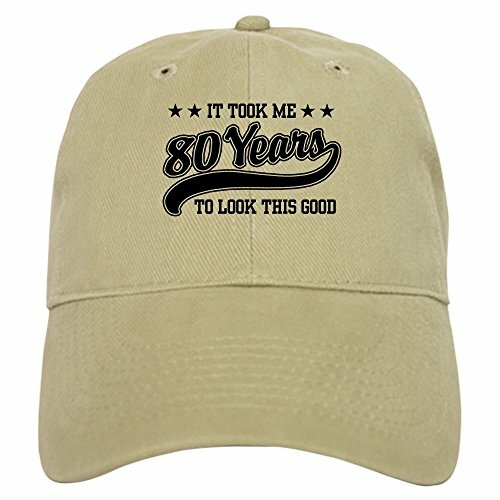 A man can never have too many hats – and a hat designed just for his 80th birthday is a fun and inexpensive gift! 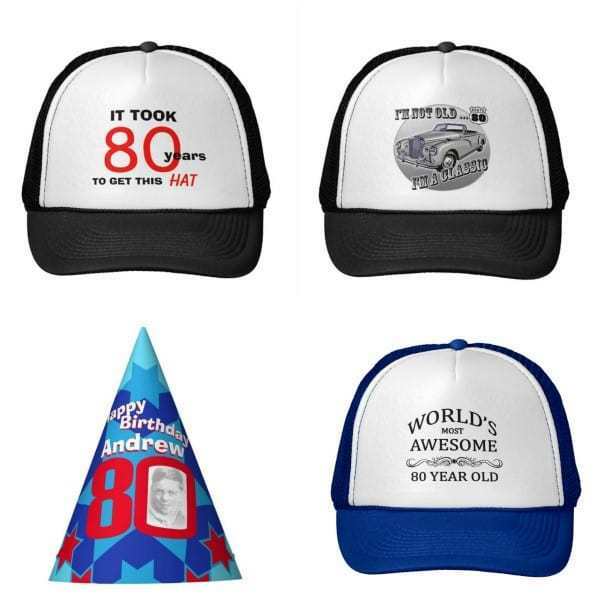 Zazzle has over 500 80th birthday hats in a wide variety of colors and designs. With prices starting at under $20, the hardest part will be choosing the right one. 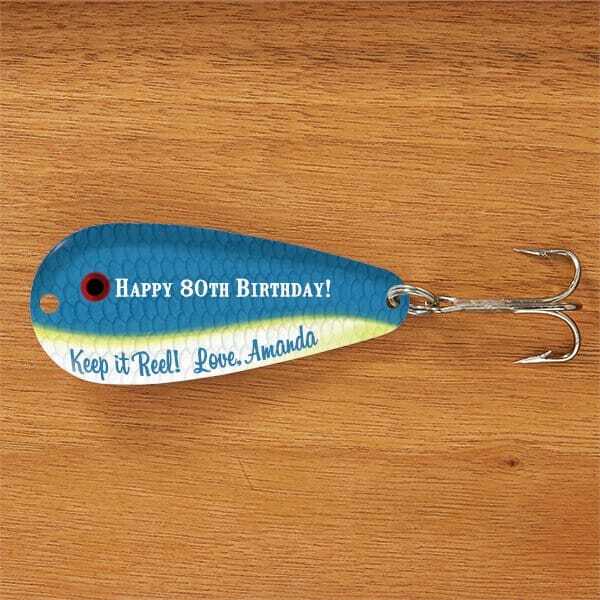 Treat your favorite fisherman to a lure that’s custom-made for his special day. 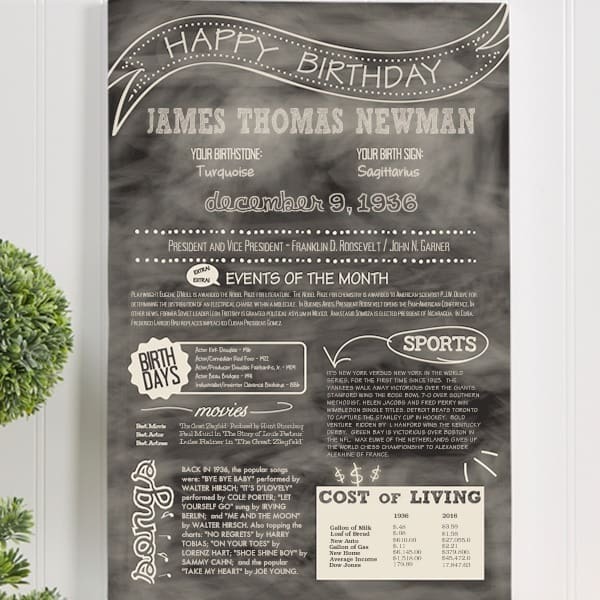 Choose from 3 different styles in a variety of colors (you can even add a picture to one of the designs), and then add your own unique birthday message on 2 lines. The perfect little gift for the life-long fisherman! Send long-lasting birthday wishes to your favorite senior! 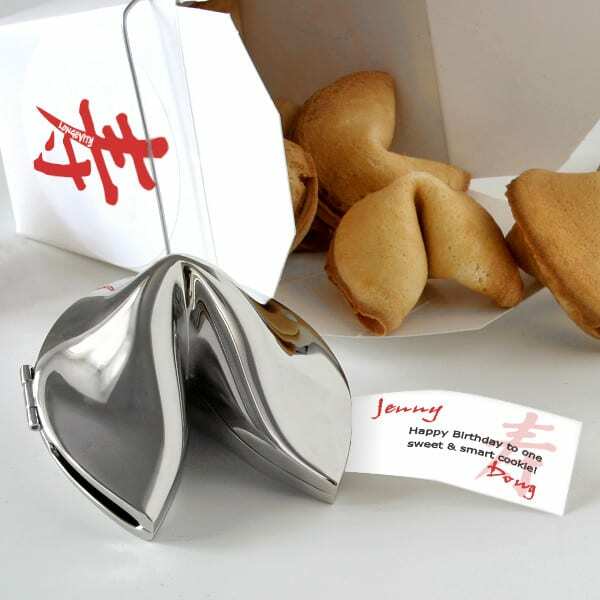 Your own personalized fortune cookie message, which includes both your’s and the recipient’s names, will be tucked into a silver fortune cookie. M&Ms have been around almost as long as the birthday boy (they were introduced in 1941), and he’s probably enjoyed his fair share of them over the years. M&Ms have changed almost as much as he has over the years – they come in loads of different flavors and colors, and even better – they can be personalized for any occasion! 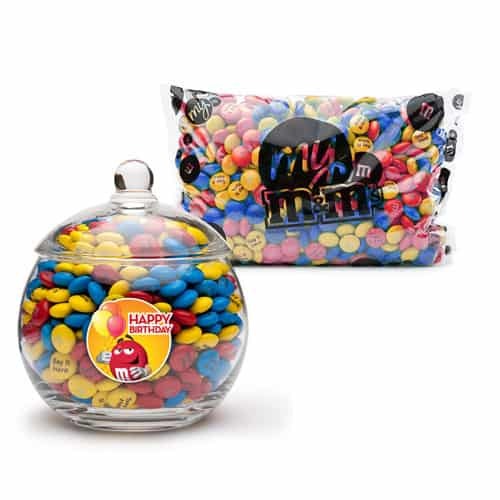 Treat him to a bowl of personalized M&Ms in honor of his special day. Choose his favorite colors, add your own 80th birthday messages, clipart or photos to create a one-of-a-kind gift that’s sure to delight! 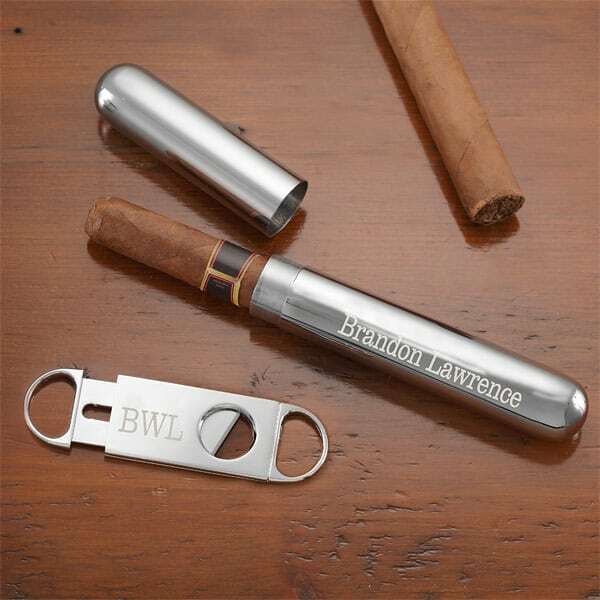 This elegant silver cigar case and cutter set makes a memorable gift for the man who likes to enjoy his favorite stogie every now and then. The holder features his name or a personalized message, and is the perfect size for tucking neatly into his breast pocket. The cutter is engraved with his monogram. An impressive gift for the cigar-lover! 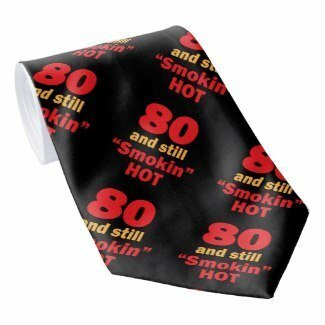 Deck your favorite gentleman out in style with an 80th birthday necktie. Choose from over 150 ties just for this milestone event at Zazzle. 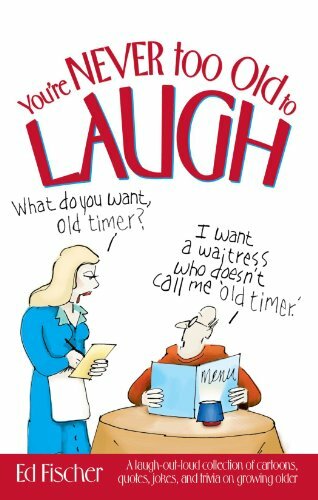 A perfect gag gift – or a gift for the dapper senior! 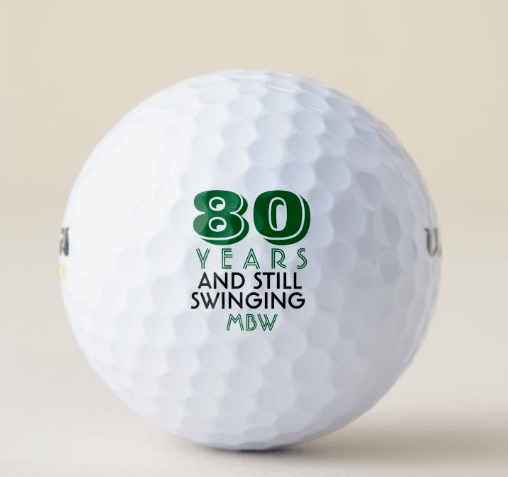 A great choice for the 80 year old golfer who’s still going strong! 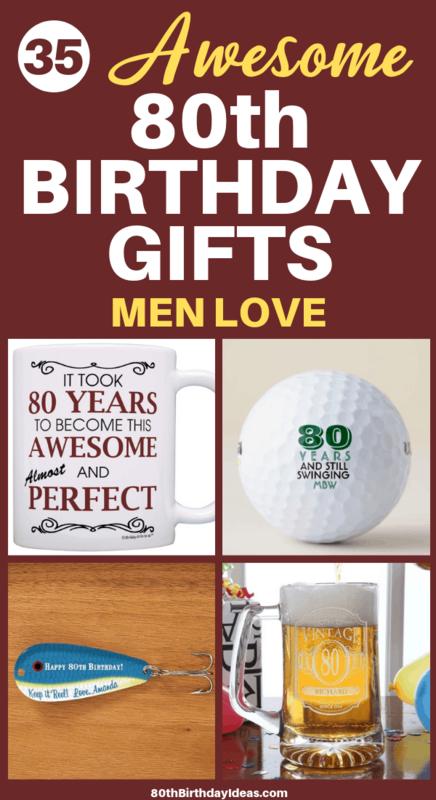 Zazzle offers an fun selection of 80th birthday golf balls and greeting cards. 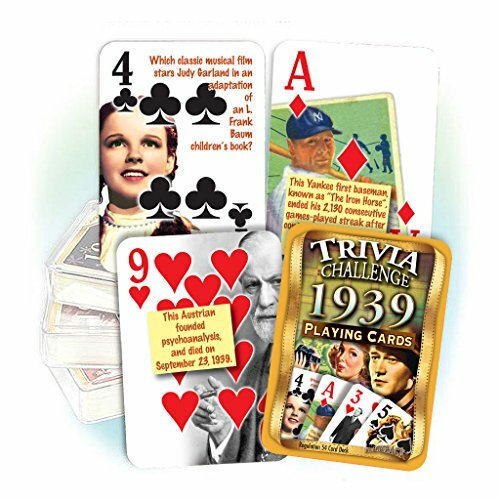 At just under $20, they’re a fun and lighthearted way to mark this special day.